Guide to Understanding Scale - Toy Wonders, Inc. In the diagram above, the same car can be seen at different scales. Scale is an indication of relative sizes. A 1:64 scale diecast car is one 64th the size of the real automobile. Written another way, the real automobile is 64 times larger. Likewise, a 1:18 scale diecast car means the real one is 18 times larger. Look at the number after the "1". The larger the number, the smaller the vehicle is. For example, a 1:34 scale car is smaller than a 1:18 scale car. Scale can be written with a colon or a slash. For example, 1:24 scale means the same as 1/24 scale. How does length relate to scale? In the image above, both cars are 1:18 scale. 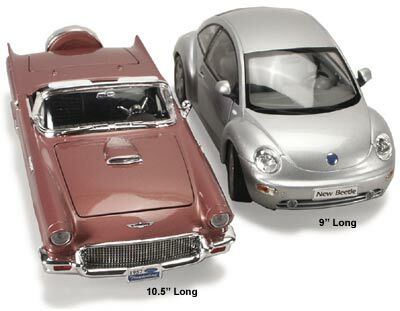 Since the Volkswagen Beetle is shorter than the Ford Thunderbird in real life, the 1:18 scale diecast Beetle will be shorter as well. The image above is a sample of how detail differs by scale. In general, larger cars will be more detailed, look more accurate, and have more features. For example, many 1/18 scale cars often have workable steering and some have spring suspension for the tires. More expensive cars tend to have more parts. Features and level of detailing will vary by manufacturer. N scale is another popular scale used in the model railway industry. Depending upon the manufacturer (or country), the scale ranges from 1:148 to 1:160. In all cases, the gauge (the distance between the rails) is 9 mm or 0.354 in. The term N gauge refers to the track dimensions, but in the UK in particular N gauge refers to a 1:148 scale with 1:160 (9 mm or 0.354 in) track gauge modeling. The terms N scale and N gauge are often inaccurately used interchangeably, as scale is defined as ratio or proportion of the model, and gauge only as a distance between rails. The scale 1:148 defines the rail to rail gauge equal to 9 mm or 0.354 in exactly (at the cost of scale exactness), so when calculating the rail and/or track use 1:148 and for engines and car wheel base use 1:160. Another term that came from the model railway industry. The name for O gauge and O scale is derived from "0 [zero] gauge" or "Gauge 0", because it was smaller than "Gauge 1" (approx. 1/32 scale) and the other existing standards. It was created in part because manufacturers realized their best selling trains were the smaller scales. G scale is for model railways, which usually because of its size and durability makes it ideal for outdoor use. Such installations are known as garden railways. G scale or G gauge are often use synonymously. Often 1/24 scale diecast model cars are used with G scale railroad cars and accessories in various train layouts.